Quite Recently US scientists discovered two giant whirlpools in the Atlantic Ocean, off the coast of Guyana and Suriname. 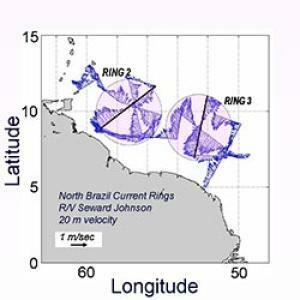 It became a sensational discovery because this part of the ocean has been studied thoroughly and no one expected anything like that to appear in this area. No one knows where the whirlpools came from and what surprises they may bring to people. According to Brazilian scientist Guilherme Castellane, the two funnels are approximately 400 kilometers in diameter. The funnels reportedly exert a strong influence on climate changes that have been registered during the recent years.